Hypnosphere is yet another addition to the burgeoning ranks of the numerous Berliner Schule devotees. This mode of expression arose quietly during the 1970's, fostered equally by technological advancements, dissent with the status quo and the spirit of experimentation. Nowadays, spacemusicians take their cues more from the mood enhancing qualities of the music than from its political content. Joining forces in Hypnosphere are Lambert Ringlage, specializing in crisp interlocked arpeggiations anchoring beneath glittering elastic melodies, who is contrasted by Wolfgang Barkowski, known elsewhere as Alien Nature, creator of Dark Ambient soundworlds. Together they have realized Within The Whirl, an album rooted to the traditions of classic Spacemusic yet with its sights set on the limitless borders of improvisatory textural explorations. The five tracks on Within The Whirl present a complex motivic unity. Opening with swirling, undefined forms in space, each piece begins with a quiet nightmare painted in stormcloud purple and gray. The welcome entrance of tones pulsing and echoing out of these gloomy projections builds to a climax of dynamics, instrumentation and tension before reversing itself and unwinding back towards a placid conclusion. These distinctive dotted rhythms oscilate the realizations between the atonal and tonal - cascading as white pin points around a line stretching forever into the cold blackness of space. On two of the tracks, if not the emotional plane then at least the energy level rises with the added intensity of certain protracted drum elements; however robotic. 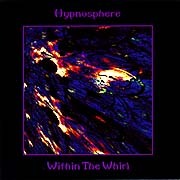 Listening to Hypnosphere is a satisfying experience both for those steeped in the nostalgic remembrances of the Golden Age of Spacemusic as well as those who seek works that are more than a mere veneration of the past. The realizations made by the inheritors of this modern musical language reveal new truths about the original - Kosmische Musik.